Because of the language difference, expats can be an easy victims of frauds. In a world where one often have to live abroad if he wish to have better opportunities, this should not and will not be considered as normal. Those newcomers do not often speak the local language fluently, they have no family member to help them, and it might be embarrassing to ask to their newfound friends to host them for a few days. The blockchain technology can change that. By using a smart contract in order to bind two individual, we leave a digital trace of the agreement between the tenant and the renter. His inviolability prevent any attempt of modifying or deleting said trace. In case of a disagreement, both part can refer to the justice to settle down the dispute. Create a contract between the tenant and the renter. Both parts can terminate the contract. When the contract is terminated, the money is automatically sent back to the tenant. The renting price and the longevity of the stay can be modified along the way by both part (if they both agree), the critical part being the deposit. The Smart Lock at the front door will be connected to the smart contract giving access to the flat as long as the there is no conflict in date & payments on the SC. 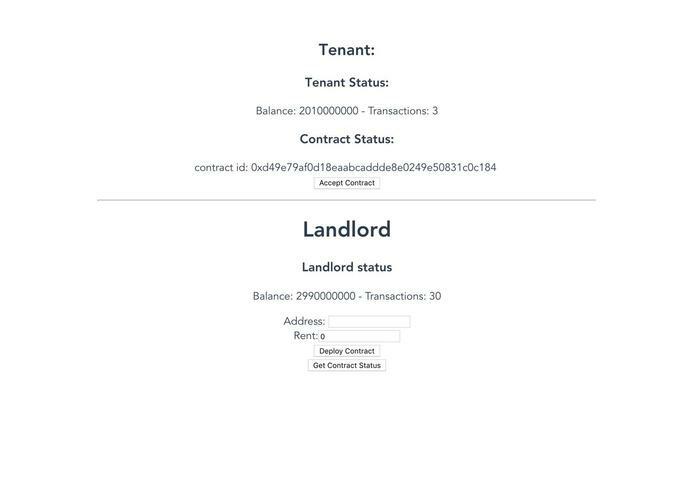 We used the HashStax platform to connect both the landlord and the tenant through Smart Contracts. The landlord can deploy a smart contract from the user interface defining the rent and the address of the house. For the sake of the demo when the contract is published and is ready to be used we use HashStax storage solution to save the address of the contract so that the tenant can be notified of its existence. When the contract shows up in the user interface of the tenant, he/she can choose to agree to it. We didn't finish to implement the raw transaction from the tenant side to send funds to the contract. The contract gets compiled, we can call methods on it and we can interact with it but we didn't manage to send funds to it to deposit and release afterward because of the complexity of the task. Been able to build a great team and find out a solution to a real problem in expat mobility. We are happy to see that working with Blockchain technology does not have to be a hassle. HashStaX simplified enormously the task of deploying and working with smart contracts. We learned how to use HashStaX and improved our understanding of smart contracts written in Solidity. We learned how to use IdentityChain. Keep validating the opportunity with real-estate services and share-rooms apps like Badi. I worked on the smart contract deployment from the user interface. I used Vue.js for frontend calling HashStax APIs to that managed ethereum network, wallets and smart contract deployment on the network.